The Caribbean is one of the most beautiful and idyllic spots on the planet. A place where the turquoise waters, white sand and gentle breeze come together to comprise an irresistible paradise that’s perfect for a beach wedding. There are several huge advantages to having a beach wedding. The biggest of which is the sea itself, as no hall or garden can offer the same levels of beauty. If you’re longing for a beach wedding, your best bet is to leave the planning and organization in the hands of experts. Let an excellent wedding planner take charge of each and every detail, freeing you from stress of any kind. We at Weddings by BlueBay have a team of the best wedding planners and organizers. These experts will ensure that you and your partner have the wedding of your dreams. At Weddings by BlueBay, our only limit is the inspiration of the couple, who will discover the powerful link between inspiration and happiness, surrounded by the majestic Caribbean. Synonymous with romance and magic, the shores of the Riviera Maya spill into the waters of the Caribbean Sea, surrounded by spots of outstanding natural beauty, archaeological areas, secluded beaches, Mayan traditions and memorable sunsets. In this beautiful Mexican destination, you can enjoy an unlimited selection of eco-tourism activities, visit protected natural areas, explore theme parks, take a dip in age-old cenotes and sample traditional Mayan cuisine. 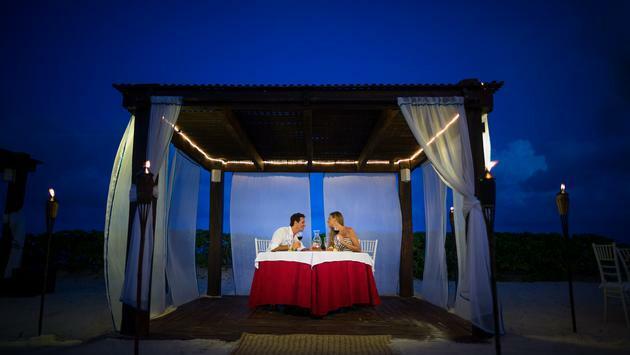 Once the sun goes down, you can make the most of the iconic nightlife offered by Playa del Carmen and Cancun. The warm climate and cool breeze will ensure a unique and unforgettable ceremony, where all aspects will run smoothly thanks to Weddings by BlueBay’s excellent wedding planners. 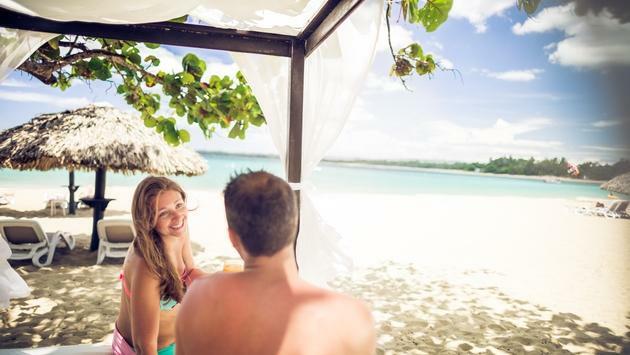 If you’re looking for a break from your daily routine and want nothing more than to lounge on the beach, listen to the swell of waves, sip on an exotic drink and celebrate an authentic and different wedding, the Dominican Republic is the place for you. In this country full of rhythm, merengue music and good vibes, you can visit the world’s most spectacular waterfalls, dive in crystal-clear water brimming with marine biodiversity and sample typical Dominican delicacies. This destination gives you the chance to enjoy a wide range of water sports, allowing you to discover what the Caribbean Sea really has to offer. The BlueBay Villas Doradas**** hotel is found in the city of Puerto Playa, with this resort being exclusively set aside for adults. It’s the perfect spot to enjoy the most important day of your lives, in a setting of pure luxury and tranquillity. The resort offers a vast range of activities and entertainment services that are conducive to an unforgettable holiday, where you will be made to feel special at all times. The BlueBay Villas Doradas resort also has an ideal location, bordering the Playa Dorada golf course: an exclusive, top-quality sports complex where you can also play basketball, table tennis and football. The BelleVue Dominican Bay*** hotel lies on the coast of Boca Chica, surrounded by crystal-clear waters, fine sand and adventure opportunities. Here, you can get a first-hand experience of the most traditional Dominican customs, providing an opportunity for unforgettable moments, thanks to the magical landscapes and hospitality of hotel staff and locals alike. This resort gives you the opportunity to sample typical regional dishes, with the La Spiaggia and Caribbean Bay restaurants being renowned for their creativity and culinary originality. They are sure to serve up a fantastic banquet for your wedding. If you’re looking for authenticity, intimacy and moments of relaxation, BlueBay Grand Punta Cana**** is the place for you. Located in the magical town of Cabeza de Toro, this hotel is adjacent to a beautiful beach surrounded by popular tourist attractions. 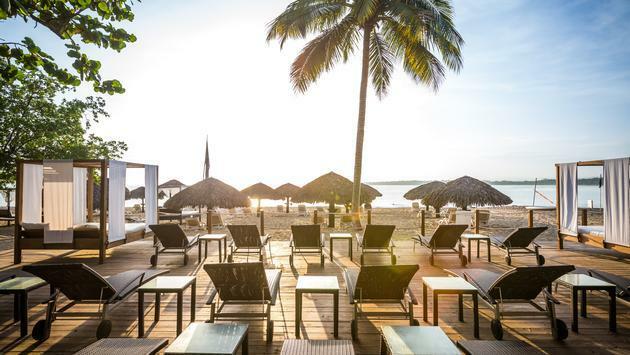 The resort is suitable for family and friends, where our aim is for people of all ages to enjoy the beach, swimming pools and luxury bedrooms while making the most of the hotel’s broad range of entertainment activities. As with all BlueBay hotels, the culinary offerings are exquisite: a fusion of traditional flavors at the hands of vastly-experienced chefs. The BlueBay Grand Esmeralda***** resort lies in the midst of the tropical forest in Playa del Carmen, with an incredible private white-sand beach, palm trees and a family environment brimming with fun and happiness. This is the perfect place to celebrate your love in the company of family and friends, where we guarantee unforgettable moments of fun, adventure, entertainment and—above all else—culture. This luxury resort has received various prizes for its excellent service, great food quality and incredible location. Blue Diamond Luxury Boutique Hotels*****GL is one of the two luxury resorts of the large BlueBay Hotels & Resorts chain, bearing the Small Luxury Hotels of the World label. If you’re looking for an intimate escape where you have the magic of the Caribbean Sea all to yourself, this is the ideal destination for you. Here, your requirements and comfort are of the utmost importance. This magical luxury resort is surrounded by natural beauty spots, crystal-clear waters and luxury bedrooms, where you will find optimum relaxation in the incredible wellness space, which is characteristic of the hotel.